Anthropometry which describes the tools and techniques for taking various measurements on the living human being and the skeleton is not only important to the teachers and students but also of great use to research workers. 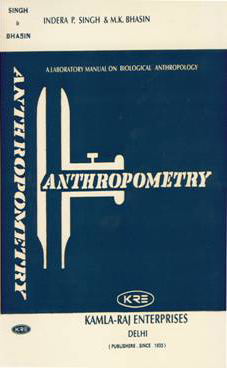 The introductory chapter briefly describes the evolution of anthropometry as a scientific tool and touches upon important landmarks used in its development. Chapter II describes the various instruments and items of equipment used for studies in this field and has been adequately illustrated by suitable diagrams. Somatometrictechniques, the landmarks in the body used in measurements, the various types of measurements their expression and the indices derived there from the subject matter of Chapter III. Also, it includes a brief outline on Somatoscopy. Chapter IV and V are devoted to Osteology and Osteometry and indicate the various terminologies used and provide an extensive description of the actual measurements on the various bones of the body. The chapters include an adequate number of diagrams of the various bones indicating clearly the landmarks. Chapter VI is devoted to Craniometry and Chapter VII briefly highlights the importance of Statistics in the selection of samples, treatment and presentation of anthropometric data. The book will be great use as a manual to students and research workers in the field of Biological Anthropology/Human Biology.